As much as I love pens, I have long had a soft spot for good notebooks, especially where a lot of thought has plainly gone into design and manufacturing. The past two years have seen the release of some great new products, and these books from a UK-based company called Say Nice Things are no exception. The "Cadence" Notebook from Say Nice Things. Andy from Say Nice Things sent me two hardcover books, a "Curtis" A5 Journal, and a "Cadence" A5 Notebook, and I'm impressed with both. The covers are made from what the company calls a "soft Peltouch" material (it feels like vinyl) with a screenprint pattern. The "Curtis" features a dark glossy polka dot pattern with a blue highlight in the bottom left-hand corner, while the "Cadence" features a bicycle pattern with a white highlight. The covers feel very durable, lay flat, and close snugly with a tight elastic band. The "Curtis" A5 Journal from Say Nice Things. The layout of these notebooks makes them somewhat unique. The journal is a larger book, with 192 pages of 90gsm paper, split into six 32-page sections with an index and tabs for easy navigation. Four of the sections contain lined paper, one contains a combination of blank and graph pages for "sketching and colouring," and the last contains an undated 12-month calendar "for forward planning." 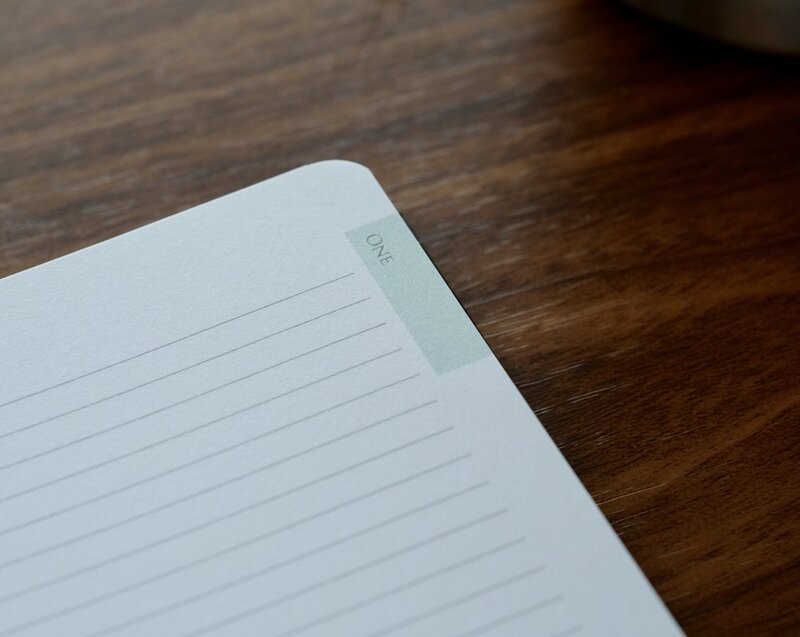 The notebook is noticeably slimmer, reminiscent of a Quo Vadis Habana, with 128 pages of the same 90gsm paper, but broken into three "sections" of 95 lined pages, 16 plain pages, and 17 reticle grid pages. I like that Say Nice Things has included different sections within their notebooks: the concept reminds me of the five-subject notebooks that I used to use in school, updated for today's popular bound hardback format. These are very attractive, understated notebooks, and I can see myself easily using both in a professional setting. I'm impressed with the paper quality, though there was some disparity between how the white paper in the Cadence notebook and the gray paper in the Curtis journal handled fountain pen ink. I tested the paper in the Cadence with every fountain pen I have inked up at the moment - including a very wet Visconti Homo Sapiens Dark Ages - and did not experience any bleed-through or feathering. It's absorbent paper - not glossy - but it handled the fine and medium nibs I threw at it extremely well. On the other hand, the Curtis's gray paper did ok with fine nibs, but I can definitely see how you might experience show-through and some bleed-through with very wet broad (or even medium) fountain pen nibs. Other types of pens and pencils should be fine. Overall, I would say that the paper quality on both notebooks is very good, and I could easily use both on a daily basis. You can order from Say Nice Things directly via their website. The company just launched a month or so ago, but they already have a wide range of notebooks and journals for sale, including some colorful options. They are competitively priced, with the 128-page A5 notebook coming in at £12.50 ($15.40 US), and the larger 192-page journal priced at £25 ($30.81 US). Disclaimer: Say Nice Things sent me these notebooks free of charge for review purposes.